Six Colorado School of Mines professors have been named Daniels Fund Faculty Fellows for the 2018-2019 school year. Each professor will receive $5,000 to integrate ethics into their courses, developing lessons, modules or projects that feature ethical considerations as a central focus. Olivia Burgess from the Division of Humanities, Arts and Social Sciences for Nature & Human Values (HASS100) and Science in Literature (HASS407). Burgess plans to formally explore how science fiction can aid in the development of ethical reasoning in a variety of contexts, from first-year core courses to upper-division electives, and in both humanities and technical coursework. Her goal is to create integrated and engaging lesson plans and activities that link literature and engineering ethics and foster STEAM –science, technology, engineering, arts and math – pedagogies. Scott Houser from the Division of Economics and Business for Principles of Economics (EBGN201). Houser will address ethical issues regarding equity, sustainability and decision-making in the core economics course. The goal is to create learning outcomes, assessments and learning activities that will explicitly focus on ethical considerations and analyses. Derrick Hudson from the Division of Humanities, Arts and Social Sciences for Global Studies (HASS200). Hudson intends to explore how moral and ethical values change as societies experience more development and become increasingly complex. 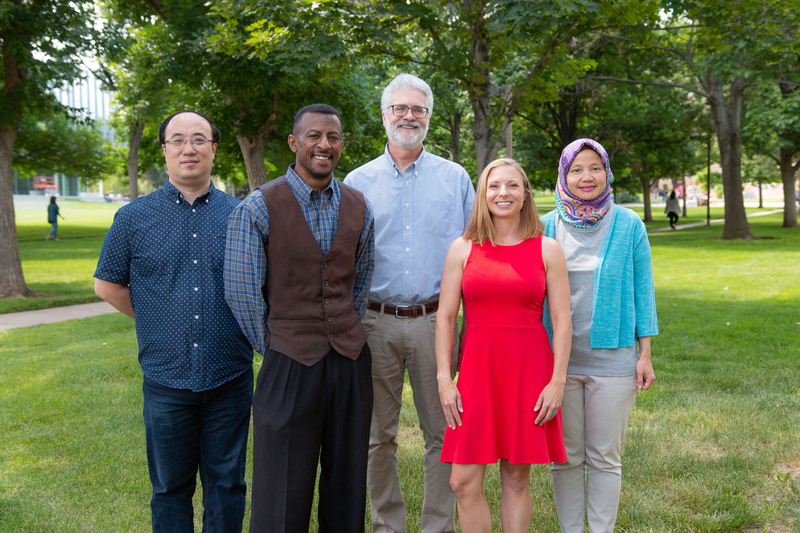 Utilizing insights from concepts in moral psychology and the sociology of religion, the fellowship will support the development of activities that will challenge students to explore the connections between ethics and development in the global era. Mirna Mattjik from the Division of Engineering, Design and Society for Integrative Design Studio Years 2 and 3. Mattjik proposes to shift ethics instruction in the Design Studio from a focus on professional codes of conduct to the active appraisal of the ethical implications of design. Of particular interest are the products of the design process and how to employ social justice considerations in proposed solutions. Her proposal also has an active research component, which will analyze and compare students’ ethical problem-solving abilities, and includes an iterative process to improve student outcomes. Salman Mohagheghi from the Department of Electrical Engineering for Power System Operation and Management (EENG581) and Power Grid Risk Management (EENG 584). According to Mohagheghi, although electrical engineering students learn about the importance of the environment and the availability of power, they are not taught in sufficient detail to grasp the delicate interconnection between energy, environment and society. His objective is to develop educational modules, homework assignments, in-class activities and course projects, all centered on social and environmental ethical dilemmas. Hua Wang from the Department of Computer Science for Introduction to Machine Learning (CSCI 470). Wang plans to lay the groundwork for artificial intelligence research ethics. In particular, his project proposes to study autonomous trading agents in finance, self-driving cars and biomedical technology. In each of these areas, machines are not only capable of causing serious harm, but they assume responsibilities once reserved for humans. As such, they raise fundamental ethical questions which should be addressed in the classroom. Toni Lefton and Sarah Hitt, both from HASS, for Innovation and Discovery in Engineering, Arts and Sciences (HNRS105). Lefton and Hitt’s first fellowship supported their efforts to incorporate ethical considerations into the first-year honors course. This award will support their goals to overcome the pedagogical challenge of ensuring knowledge transfer between technical and non-technical courses and the social/psychological challenge of disciplinary silos, and assess the outcome of micro-insertions of ethical discourse across a yearlong curriculum. Chuan Yue from the Department of Computer Science for Introduction to Cryptography/Theory of Cryptography (CSCI 474/574) and Information Security and Privacy (CSCI 475/585.) Yue used his first award to revise many “abstract” homework problems into “mini design” problems, where students are required to make more complex, professional decisions. This award will focus on systematically revising and experimenting with some cybersecurity lab exercises. Funding for the fellowships comes from the Daniels Fund, which awarded Mines’ Ethics Across Campus Program a second grant in February. In 2016, Mines became the first STEM-focused university to receive Daniels Fund grants for ethics. The new $178,000 grant will also support efforts to further develop a website so innovations can be more widely shared, hosting pedagogy workshops for faculty, assessing the Mines curriculum for optimal places to incorporate ethics, bringing in world-class speakers and laying the groundwork for a certificate in professional ethics.